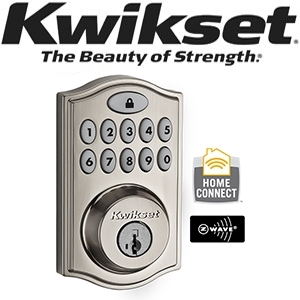 Kwikset, the leader in residential security, introduces the NEW SmartCode 914 deadbolt with Home Connect Technology! This deadbolt is a new addition to the SmartCode family, and is the most robust SmartCode lock ever made. The metal housing delivers quality that can be felt for added security and durability. Expanding your security system solution with Home Connect technology, a Kwikset SmartCode keyless entry lock will allow the lock to communicate wirelessly to security and home automation systems via Z-Wave to enhance your customer's lifestyle.